Statues, monuments, plaques, wayside historical markers and signs, and named parks and boulevards are just a few examples of how our communities memorialize exceptional people, places and events. In recognizing their importance in preserving and sharing local history, Erie Yesterday, in partnership with Erie County Councilman Jay Breneman, has begun an inventory of veteran memorials found in Erie County. The purpose of the inventory is to engage the public – YOU – in helping to identify and record all memorials which recognize our military men and women’s contributions to our region and our national story. The inventory is a work-in-progress, and we need your help to compile it. To add a memorial to the Erie County Veteran & War Memorials Inventory, please complete the online memorial submission form. Or, you can download a printable version of the form and mail the completed form to Erie Yesterday, 356 West Sixth Street, Erie, PA 16507. 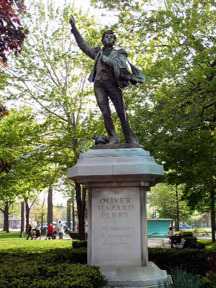 Oliver Hazard Perry is best known for his command of the U.S. naval fleet built along the shore of Erie County, PA and the defeat of the British off Put-In-Bay, OH in the Battle of Lake Erie September 10, 1813. This statue, which is made of bronze and limestone and stands twenty-two feet, was constructed by Captain William Green Turner. Turner’s presentation is of the young man the moment he stepped aboard the Niagara after leaving his heavily damaged Lawrence – right arm raised and the battle flag slung over his left shoulder. Perry spent most of his years at sea following the Battle of LakeErie, dying of yellow fever at the age of 34. Dedicated August 23, 1985 in recognition of Perry’s 200th birthday, the statue is an exact replica of the original which stands in his hometown of Newport, Rhode Island. Born in Waterford, PA, Vincent is recognized for his brilliant defense of Little Round Top during the battle of Gettysburg where he was mortally wounded. In 1995, a committee was formed whose charge was to honor the local hero with a statue. The committee, working with artist Michael Kraus, adopted a pose showing Vincent in command of the 83rd Pennsylvania Volunteer Infantry at a critical point in the battle moments before he was struck in the hip by a confederate bullet. The bronze 7 foot statue was dedicated in September 1997. The Soldiers and Sailors Monument is the second oldest monument in Erie County. 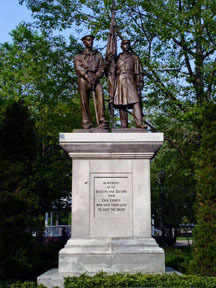 It was designed by Martin Milmore using bronze with a granite pedestal, and honors the soldiers and sailors of Erie County who gave their lives in the American Civil War. The building and placement of the monument were very controversial issues. Originally to be funded using tax dollars, the monument was built with private donations after many Erie citizens expressed discontent over the expense. Later, when the monument was ready to be placed, a second public debate surfaced – where should it be located? While some wanted the monument placed in Perry Square Park, others wanted it placed in the middle of State Street. Construction of the monument was completed in 1872, but because the debate over location continued, it was not officially dedicated until 1939. Only two Erie County Civil War veterans were alive to witness the dedication ceremony. Unfortunately, neither was able to attend the event. In early 1753, Fort LeBoeuf was built by the French as part of a system of fortifications extending from the St. Lawrence to the Gulf of Mexico designed to help protect French interests in the Ohio Valley. That same year, George Washington, then a Major representing the Governor of Virginia, delivered a letter to the commander of Fort LeBoeuf warning the French to withdraw their forces from this region claimed by Great Britain. Six years later, the French withdrew their forces and burned the fort. The English took possession of the site and built a new fort in 1760, which was subsequently burned in 1763 by Indians during Pontiac’s rebellion. Wanting to memorialize Washington’s visit, the George Washington Monument was erected in 1922 by the citizens of Waterford, PA at a cost of $13,000. It was situated upon the site of the original Fort LeBoeuf, which was in the middle of High Street between the Eagle Hotel and the historic Judson House. The monument was moved in 1945 to the lot beside the Eagle Hotel. What makes this monument unique? This is the only statue of Washington wearing a British uniform in Pennsylvania.